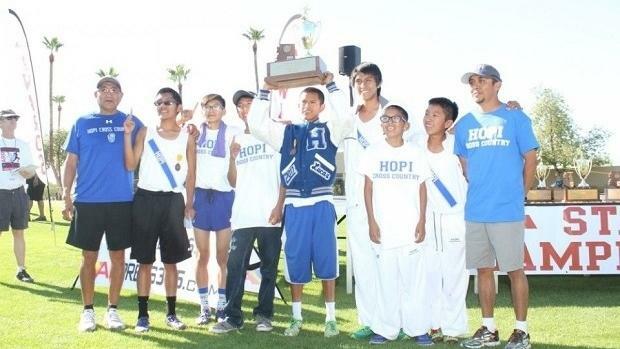 The Hopi Bruins will be on the hunt this season for their 28th consecutive cross-country State title this season; the longest winning streak in the nation. Their no. 2 man from last year's State Meet, Jihad Nodman (Jr.) ran a sub 17-minute performance at Cave Creek Golf Course. Jihad is ranked as the no. 3 returner from last year's season with his PR of 16:38.3 from Desert Twilight. Hopi also return with Steven Baker (Jr.) who holds PRs of 4:49 for 1600m and 17:31 for 5k. Last season, Steven finished 20th in the D4 boys' race at the cross-country State Meet. Dewayne Laban (Jr.) was a solid no. 3 man for the Bruins and like Steven returns with a personal best of 17:31 for 5k. Last year he finished 17th at the cross-country State Meet after starting the season just under 20 minutes. The Hopi Bruins' will rely on their junior class to step up this year and rally the rest of the squad all the way through the first Saturday of November. Steven Baker, Jihad Nodman, Dewayne Laban. We're just getting together and once we get everyone out we should be good. Stay healthy and academically eligible.